anaba: Poll: Which Infant Stool Sample? Poll: Which Infant Stool Sample? I'm taking a poll. 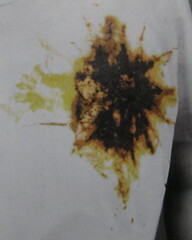 Which 1907 infant stool sample does Cai Guo-Qiang's Whitney Biennial Gap Artist Editions T-shirt most resemble? b. constipated, greasy stool of artificially fed infant. this stool is due to the administration of too much fat. it is foul-smelling, like limburger cheese. d. stool of a case of diarrhea discolored by bismuth. e. diarrhea discolored by bismuth. note blood and mucus. 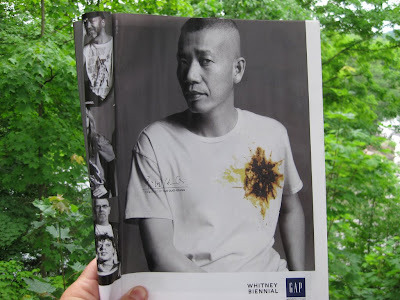 Close-up of Cai Guo-Qiang's Whitney Biennial Gap Artist Editions T-shirt. Note splatter and apparent absence of blood. Def B, with perhaps a touch of C.
D, no question. It would of been better with a touch of blood. So few posts are worthy of forwarding to my beau. He'll be thrilled. gonna put it on you. meconium is darker, more like tar. what's the difference between d and e? looks more like chaw spit to me. d. and e. differ in that e. contains blood and mucus. 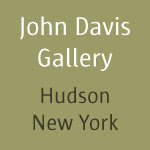 By comparing Cai Guo-Qiang's art to human excrement you are attacking art and artists. You should be ashamed of yourself. Banana Republic is the higher end of Gap and Old Navy is lower. So I think they should have different poops. Different workmanship, aspirational pricepoints and different poop thread counts. Cross marketing would just muddy the brand identities.